‘I come from there and I have memories / I have a mother /And a house with many windows…’ writes one of my favourite poets Mahoud Darwish. Tsering does not push herself to the forefront of the narrative. Her love for the land and its people overshadows her and she becomes secondary. She carefully reconstructs Tibetan life through conversations with her relatives – aunt Tashi, uncle Phuntsok and Ashang, and over thirty cousin-brothers and sisters – and anyone else who has a story to tell. Like a veteran detective, she lets nothing go unnoticed. To define her people, their civilization and the present dilemma under occupation, Tsering has picked up the tiniest scraps of evidence such as the way a young man stands leaning against a newly-installed electric pole in Kegyu, or the obstinate persistence of nomads to stick to their land and animals, no matter how much they are bombarded with ideological indoctrination or propaganda about the benefits of life under the red flag. Very little has changed in Tibet since the terrible campaigns of the early years of China’s occupation. If at all, the scale of repression has increased. Since the 1990s over 2.5 million Tibetan nomads are being forced to settle at permanent locations. This has caused joblessness, social disharmony and most of all the death of over nine thousand years of Tibet’s mobile civilization. Nomads are governed by decisions made in Beijing. There is, Tsering writes, ‘no place for truth in the system, just the act of allegiance’ to the rulers. 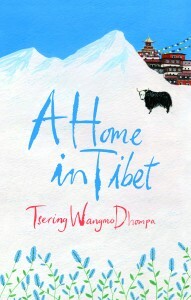 A Home in Tibet is a crowning achievement, a quintessential book worthy of the granddaughter of a Khampa chieftain from Dhompa in eastern Tibet. This should and must be read by all Tibetans and their friends for a thoroughly nuanced understanding of Tibetan live then and now.